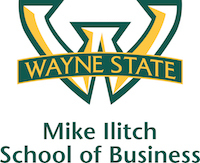 At the April 7 Committee of 200 Reachout at Wayne State, three MBA students from the Mike Ilitch School of Business were presented with $10,000 awards from the C200 Foundation. Winners Maria Arpino, Ana Kostic and Olta Sota will also become members of the C200 Scholars Network, through which they will receive incomparable access to C200 members, as well as nationwide networking and learning opportunities. The Committee of 200 is an international organization comprised of more than 400 of the world’s most successful women business leaders, half of whom run companies with revenues in excess of $100 million. Committed to empowering future business women, members share their expertise and insights with students around the world through the C200 Foundation’s signature Reachout programs. The WSU event was the group’s first-ever Reachout in Michigan. Speakers from the Detroit area included Florine Mark, president and chair of the WW Group; Denise Ilitch, president of Ilitch Enterprises; Luanne Thomas Ewald, CEO of Children’s Hospital of Michigan; and Susan E. Burns, vice president for development and alumni affairs and president of the Wayne State University Foundation.